While the idiom goes, “A picture is worth a 1000 words,” sometimes I find I have a little more to say about a place or experience than just 1000 words. Typically, those words evolve into a story, a blog, or in extreme cases, a book. More and more frequently, though, I find myself writing poems to accompany my images. Although I have composed poetry for a number of years, few people outside of my immediate family and a couple of close, trusted friends have ever read my written creations. Until now…thanks largely in part to the encouragement I’ve received from my family and friends. And because I find it becoming an important part of my creative process for self-expression. Like creating a meaningful image, inspiration for my poems come literally from everywhere and anywhere. Sometimes a poem almost writes itself, spilling onto the pages somewhat effortlessly as thoughts about a place, experience, or situation flow freely (much like arriving at a location and everything – the light, the composition, the mood – all comes together in one magical moment to snap a photograph). More often, I get a spark of an idea – a word, a phrase, or a notion – and spend time noodling on what it means to me, how I feel about it, and what I wish to say about it (similar to the visualization process I use to make photographs). During this analytical process, I dig as deep into my soul as possible to try to first understand what’s happening inside me, without judging, and then try to pick carefully the words to help reveal those emotions in a written form. I enjoy pairing my poems and photographs together to convey a broader sense and context of the observations I deem important as I’m in the Great Outdoors. In some cases, the poem adds more meaning to the photograph. In others, the photograph helps explain the poem. A poem helps me communicate the reason why I made the photograph in the first place (in more depth than a descriptive, but short, title would). A photograph gives me an avenue to express deeper thoughts in my poems. It’s very much a “which comes first, the chicken or the egg” scenario. With that background in mind, I thought I’d share a more recent photograph and poem pairing, one I created while wandering along “my” beloved Oregon coast this past May. Watching waves crashed into the cliffs or roll onto the beach is something I could literally do all day, so I started with visual inspiration from the sea, resulting in the photo you see above. Fog along the coast in the summer frequently occurs, which I find adds extra drama to the already beautiful scenery. 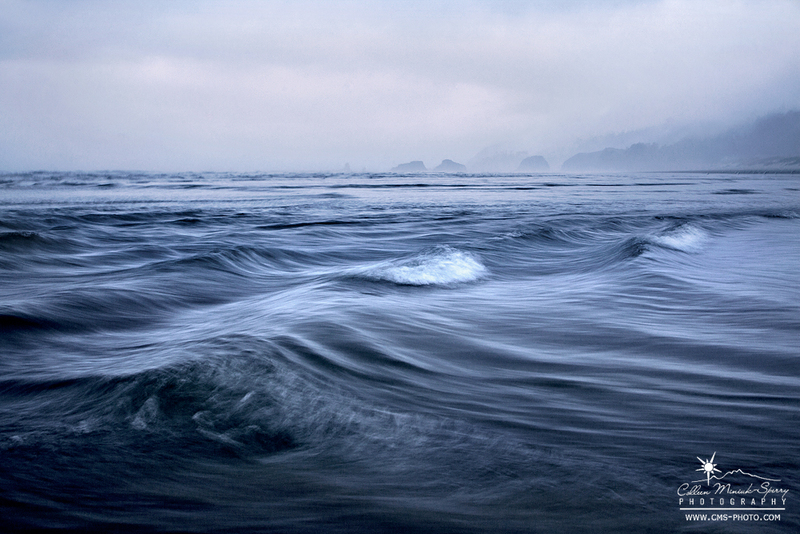 To capture a more intimate view of the waves rolling onto Cannon Beach, I walked to the mouth of Ecola Creek as the tide receded and then ran with the waves and photographed them from a low, crouched perspective as they raced onto the shore. I ended up hand-holding the camera, even at the slow shutter speed of 1/4th second, as I didn’t have time to set up the tripod. With my wide-angle 24-105mm lens, I used an f/9 aperture to get just enough depth of field combined with the motion in the waves I desired. Thunder madly into resilient cliffs. Explode into a bouquet of decay. Spray seaweed confetti across the sky . As this is my first time sharing my poetry publicly, I certainly welcome your thoughts about my photo and poem pairing so please leave me your comments below! What do you think about it? Does anyone else out there write poems to accompany your photographs? Thanks much, Tom, for not only reading it, but also for your comment! I love the photo and like you I could watch the ocean and waves all day. The first paragraph of your poem captures the spirt I felt at Cannon Beach. Thanks, Katie! You were literally steps away from me when I made this image. I’m so glad to hear you too were (and are) moved by the sea as I am. It’s a magical feeling, isn’t it? Let’s go back soon! !